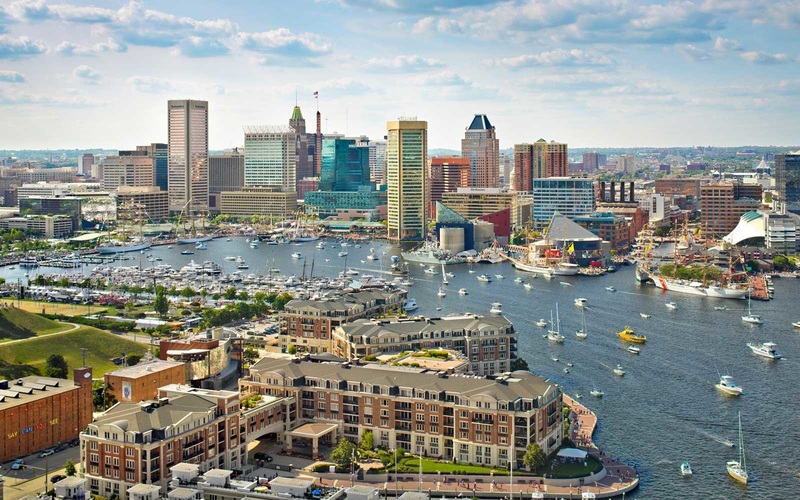 Baltimore is an independent city in the state of Maryland within the United States. Baltimore was established by the Constitution of Maryland as an independent city in 1729. With a population of 611,648 in 2017, Baltimore is the largest such independent city in the United States. As of 2017, the population of the Baltimore metropolitan area was estimated to be just under 2.808 million, making it the 20th largest metropolitan area in the country. Baltimore is located about 40 miles northeast of Washington, D.C., making it a principal city in the Washington-Baltimore combined statistical area (CSA), the fourth-largest CSA in the nation, with a calculated 2017 population of 9,764,315. Baltimore is also the second-largest seaport in the Mid-Atlantic. The city's Inner Harbor was once the second leading port of entry for immigrants to the United States, when most arrivals were from Europe. In addition, Baltimore was a major manufacturing center. After a decline in major manufacturing, heavy industry, and restructuring of the rail industry, Baltimore has shifted to a service-oriented economy. Johns Hopkins Hospital (founded 1889) and Johns Hopkins University (founded 1876) are the city's top two employers. With hundreds of identified districts, Baltimore has been dubbed a "city of neighborhoods." Famous residents have included writers Edgar Allan Poe, Edith Hamilton, Frederick Douglass, Ogden Nash, and H. L. Mencken; jazz musician James "Eubie" Blake; singer Billie Holiday; actor and filmmakers John Waters and Barry Levinson; and baseball player Babe Ruth. During the War of 1812, Francis Scott Key wrote "The Star-Spangled Banner" in Baltimore after the bombardment of Fort McHenry. His poem was set to music and popularized as a song; in 1931 it was designated as the American national anthem. Baltimore has more public statues and monuments per capita than any other city in the country, and is home to some of the earliest National Register Historic Districts in the nation, including Fell's Point, Federal Hill, and Mount Vernon. These were added to the National Register between 1969–1971, soon after historic preservation legislation was passed. Nearly one third of the city's buildings (over 65,000) are designated as historic in the National Register, which is more than any other U.S. city.